A pool benefits most when water quality and equipment are maintained 12 months out of the year. There are many options for yearly maintenance. Another option is to totally winterize and shut down the pool if 12 months is not possible. Use a solid cover and shut down the pool through the winter months. Treat the water before closing to fight off algae and ensure clear water at opening. Drain the equipment and lines of water to prevent freeze damage. Cover the pool with a safety cover to ensure debris, animals or people will not fall in while not in use. Use a timer with a freeze protector to set the equipment to operate a minimum of 6 hours a day. The freeze protector will turn the system on in cold weather to avoid freeze damage. Operate the pool a minimum of 8-10 hours a day with freeze protection. Maintain the water, pool and chemicals with regular maintenance and cleaning. What types of covers are available? There are two basic types of pool covers: a solid weighted and a spring loaded safety cover. A solid-weighted cover usually consists of a tarp-like material spread across a pool and weighted down around the edges with water bags. This cover is excellent for a total pool shut down and keeping out all debris and water. A Spring-Loaded safety cover is a high quality mesh or solid material that anchors to screws set in the surrounding deck. 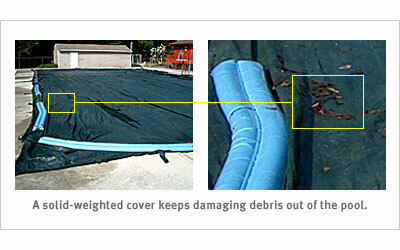 Both types of covers are capable of handling thousands of pounds of weight, and have a lifespan of ten or more years. This cover in a solid form is excellent at total shut down and maintaining water quality. The mesh variety is slightly more economical and requires the equipment to operate to maintain water quality. 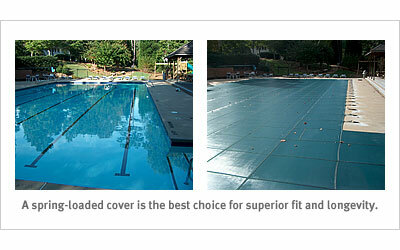 Positively Pools is an authorized dealer of high-quality custom fit Meyco covers.